After wins at West Ham United, West Bromwich Albion and this latest 2-1 win at Watford, Burnley may want to look at potential games against such as Wacker Innsbruck, Wolfsburg or Legia Warsaw should we go on the European tour that everyone was singing about yesterday. Three successive away games can be a daunting prospect even if those teams are below you in the league, but to prepare for a return home next week having won all three is a brilliant return and it really hardly matters that we weren’t at our fluent best yesterday as we completed a double over Watford with this latest victory. I have to admit, when we fell a goal behind just past the hour, and given how the game had gone up to that point, I wasn’t too optimistic of getting even a point, but out came the resilience and will to win that Sean Dyche speaks about so often, sprinkled with a bit of good fortune maybe and certainly with one of the most inspired substitutions I can recall witnessing in many a year. It was almost the perfect day although it didn’t start quite like that. We opted for cheap train tickets again from Manchester and were just driving down Cheetham Hill Road when we learned that our train had been cancelled. It was no more than a twenty minute delay and we managed to find seats on what proved to be an overcrowded next train. That, I suppose, would have been our only hiccup on the way to Watford with the pub stop close to London Euston having been sorted; that was until one of our party, and not me I hasten to add, decided to unnecessarily jump over a wall and ripped a huge hole in his jeans in, shall we say, an unfortunate place. After a short delay for shopping, we were finally on the last leg of the journey and on our way to Vicarage Road. They’ve done a good job at Watford with the ground over the years and the two people who were most influential in their rise from the lower leagues are both honoured with their names on stands to either side. To the right of the away end the previously named Sir Stanley Rous Stand is now the Graham Taylor Stand while to the left, the new stand is named the Sir Elton John Stand which bears the lyrics from Your Song across the back. I was once challenged to get as many Elton John song titles into a match report at Watford. It was the occasion of our last win there in the 2010/11 season just after Eddie Howe had become our manager. It proved to be a memorable performance and this after Daniel Drinkwater had missed a first minute chance for the home side. Anyway, none of that in this report. There were no Sad Songs sung by Burnley fans, no one went breaking our hearts and the sun only went down on the home side when those late goals went in. Sean Dyche made one change to the side that had won at West Brom a week earlier with Kevin Long coming in for the injured Ben Mee in defence. With Jόhann Berg Guðmundsson still out, it meant a second start for Spurs loanee Georges-Kévin NKoudou. There was a minute’s applause ahead of the game for Ray Wilkins who sadly passed away this week at the age of 61. I might be taken to task for this but I’m not sure it is appropriate for every Premier League game to have done this over the weekend. It happened recently for Cyrille Regis but not Jimmy Armfield. Who decides when it should or shouldn’t happen? I’m of the opinion it should be left to the clubs where they were involved and in this case it was absolutely right that it was observed at our game yesterday with Wilkins having spent time as assistant manager to Gianluca Vialli at Watford. It all started well, for the opening minutes at least. We had the ball in the net very early when Chris Wood headed home a Matt Lowton cross from the right. Just as he headed it, I noticed the flag go up. It’s the correct decision but it’s mightily close. Watford, unbeaten at home since a surprise loss against Swansea in the last game of 2017, did come into the game and soon put that early opening spell of ours behind them. We did have one big opportunity when Aaron Lennon’s low cross was missed by Ashley Barnes with Ashley Westwood, backing up, seeing his shot blocked. They had, by then, come close to a goal when Nick Pope saved well down to his right to deny their best player, Argentine Robert Pereyra. It was the sort of save we’ve become accustomed to seeing from Pope. He was, perhaps, under a bit of added pressure yesterday given that Tom Heaton was back on the bench, but if he felt that pressure it didn’t show in what was an immaculate performance. In what became an increasingly more difficult first half for us, it was good news that we got to half time still level. Yes, we could have been in front on a couple of occasions but Watford had been the better of the two sides as the players went off at half time. After a bright start to the second half, the game followed the same pattern. Goalkeeper Orestis Karnezis almost presented us with a goal when he fumbled the ball before, fortunately, blocking Westwood’s effort. On loan from parent club Udinese, he’s recently become first choice ahead of Heurelho Gomes. But, up to the hour mark, Watford were very much in the ascendancy and it was no huge surprise when they took the lead. It was unfortunate in that Stephen Ward got in a good tackle only to push the ball into the path of Pereyra who gave Pope no chance with a shot into the far corner from the left but much had to be asked about how we allowed them to get the ball into our box in the first place. I noticed Dyche go for his bottle of water and wondered what his thoughts were as we re-started. I know I thought that was probably it for us and we’d likely go on to lose the game. Oh me of little faith. With just over twenty minutes remaining, Dyche made his most inspired substitution yet. Sam Vokes came on for the disappointing NKoudou with Barnes set to go on the left hand side. We’d just won a free kick when Sam came on and he went into the box. When Adrian Mariappa headed the free kick towards his own goal, there he was to volley home from close range. He was on his own, so much so that we all probably looked to see if a flag was going up. As it happens, he was probably just in an offside position but it mattered not, the ball having come off the Watford defender. Burnley were level; Vokes had been on the pitch for 22 seconds. I seem to remember Derek Dougan doing similar to us for Wolves back in 1970 but I’m not so sure I’ve ever seen a Burnley player score a goal so quickly after coming on. In real terms, from Westwood taking the free kick it was just five seconds. The Burnley fans had been the noisier by some distance up to this point against the dreadful banging of a drum, but the noise after the goal was incredible. It was all about the European tour again and with Leicester losing it was gathering pace. Then we won a free kick on the left when Daryl Janmaat fouled Barnes. Westwood it was again with the kick, and what a good game he had. Long, who did so well overall, got beyond the far post to head it back in and then it became chaotic. Jack Cork, stand in skipper, saw his header saved by Karnezis. It came off the post; then Barnes had two goes at it before Watford scrambled it away to their left of goal. Westwood thought it had gone in at some point, although he was in no position to see. It never crossed my mind that it might have gone over the line and, given the reaction in the away end, I would suggest most though the same. I spotted the referee putting his whistle to his mouth and then point towards the centre. He’d checked his watch, it had gone in, and now the away end was just ridiculous. It was Burnley on top now and we could so easily have had another goal or two but eventually the home side decided to give it a go. They threw men forward and got balls into our box. My major concern was that they would send on Andre Gray, roundly booed by the visiting fans at the mere mention of his name before kick off, and he might just get a goal. On our part, we defended superbly and should have had the game won long before we did. That was down to referee Paul Tierney. I’m not sure where he got five minutes from to add on. Watford won a corner just as we hit five minutes. I knew he’d allow them to take it, which he did, but he played on and played on and played on. I know it’s a minimum but when it was approaching seven minutes I was beginning to wonder if he’d lost track of time altogether. Finally he blew, the away end celebrated and Dyche had strong words with fourth official Tim Robinson, clearly pointing at his watch as he did. 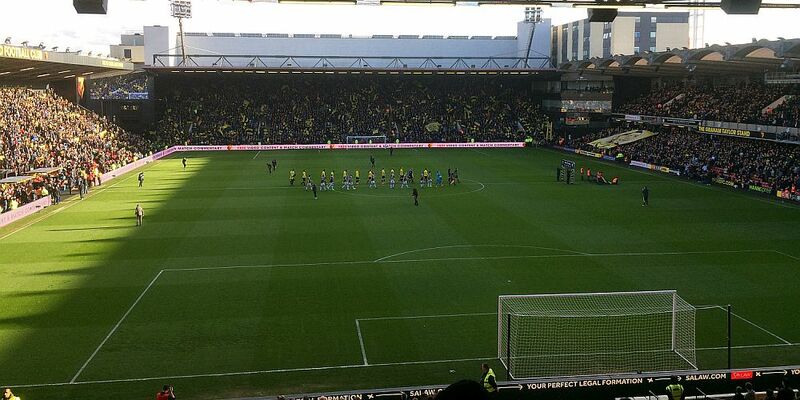 Back at Watford four years ago, we earned a point when all those around us in the promotion chase were losing. It was a big result for us. Only Barnes from yesterday’s team played on that day and I’m sure he and the rest of the team saw it as just as big a result. They certainly suggested that with their celebrations in front of the Burnley fans at the end that were prolonged and somewhat excitable. Embed from Getty ImagesAs the results elsewhere were announced, there was a huge roar when we heard Newcastle had won at Leicester to move us six points clear of Leicester in the table. I wonder if the players were checking their passports for a potential European tour just as much as we were. Speaking on Goals on Sunday this morning, former Liverpool and Fulham defender John Arne Riise was asked about the possibility of us being in Europe next season. He said: “Before the season I would never believe it. I still can’t believe it is going to happen but if they keep going like this it could happen. But I can’t really see them taking that step to play in Europe.” I suspect he didn’t bother looking at any league tables. That was it, another three points on the road, 27 of them this season which is more than in the three previous Premier League seasons combined. It’s also the first time we’ve won three successive away games in the top flight since we beat Sheffield United, Spurs and Wolves at the start of the 1973/74 season. And the last time we won four in total, home and away, was when we collected six successive wins back October and November 1968. They were against West Ham (home), Stoke (away), that fantastic 5-1 beating of Leeds on the Turf, Leicester (away), Ipswich (home) and QPR (away). We even won a couple of League Cup ties in the middle of that too. This team of ours just keeps on breaking records and it is an absolute joy to be there and watch them do it. All we had to do then was get home. This time there were no delays, no ripped jeans, they’d been discarded, and now we can all get ready for that rare even, it seems, of playing at Turf Moor next week when this team of ours deserves a full house offering great support. What another fantastic away day. Watford: Orestis Karnezis, Daryl Janmaat (Stefano Okaka 76), Sebastian Prödl, Adrian Mariappa, José Holebas, Abdoulaye Doucouré (André Carillo 85), Étienne Capoue, Kiko Femenia, Will Hughes (Richarlison 85), Roberto Pereyra, Troy Deeney. Subs not use: Heurelho Gomes, Miguel Britos, Craig Cathcart, Andre Gray. Yellow Cards: Abdoulaye Doucouré, Stefano Okaka. Burnley: Nick Pope, Matt Lowton, Kevin Long, James Tarkowski, Stephen Ward, Aaron Lennon (Jeff Hendrick 81), Ashley Westwood, Jack Cork, Georges-Kévin NKoudou (Sam Vokes 70), Chris Wood, Ashley Barnes. Subs not used: Tom Heaton, Phil Bardsley, Charlie Taylor, Dean Marney, Nahki Wells. Yellow Cards: Georges-Kévin NKoudou, Matt Lowton.